Two days ago I got a new Macbook Pro. I have been fiddling with it, trying to figure out how everything works. I have mastered word processing and email. I still don’t know what anything else does. I would like to think that in the next few weeks I will have it all down. But I have had my car for almost six years and I still don’t know what half the controls do, so chances are that is not going to happen.Every once in a while I press a button on my dashboard, stuff happens, and I feel like I am playing charades with the car. I lose every time. Today I downloaded Open Office onto the new laptop. At first it did not allow me to download anything from a source other than the Mac Store. So… I just paid a small fortune for this thing… I think I should be allowed to do whatever I want to it. It took me a while to figure it out, but I did manage to get those ridiculous settings suspended. 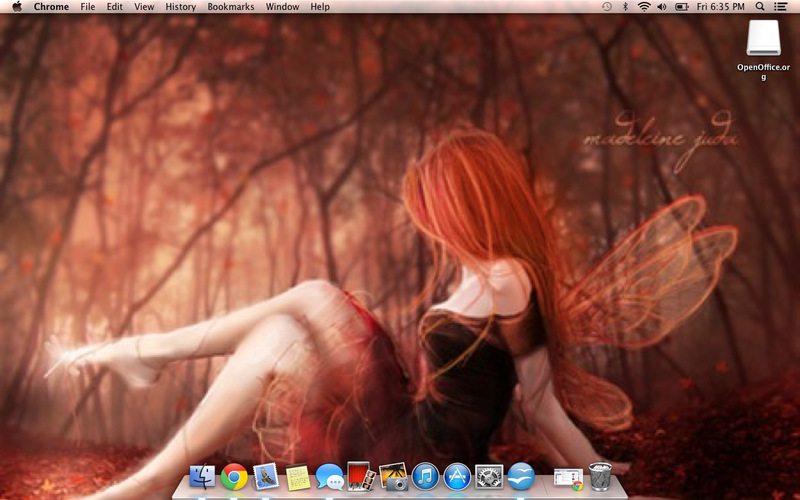 Then, after I downloaded the application, it put things on my desktop. I am very selective about the things I put on my desktop, and unlike my old laptop, this one is not easily customized. It put the icon on my desktop and there was no moving it. The laptop decided it will be totally neurotic about placement. Unfortunately I too am rather stubborn about such things. It seems this machine is very controlling about what I can and cannot do to it. This is a screen shot of my desktop. One icon. Do you see it? Very annoying. Clearly this will be a battle of wills.